Paleo might have started out mostly in the US, but it definitely isn’t staying there. Nutritionally, of course, the basic idea is the same no matter where you are: a grain is a grain on any continent. But some of the grocery shopping advice for Americans just doesn’t apply to anyone else – so if you live in Australia and you’re frustrated reading about American grocery chains and online providers that won’t ship to you, here are some answers. The first thing to remember about finding Paleo food is that it’s not as hard as you think it is. Some recipes can make it seem like if you want to eat Paleo, you need a big pile of special ingredients that are only really available (or affordable) in the US. But if you look at the big picture, these recipes are usually for baking and treats, and you can eat completely Paleo without worrying about any of them. There are a lot of recipes for Paleo baking out there, but it’s not because these foods should be the majority of your diet. It’s because baking with grain-free flour is tricky and unfamiliar. Really, you can be Paleo without ever eating any of these weird ingredients. Paleo is about eating meat, vegetables, and healthy fats. You can get those foods in any country. All the baking with arrowroot starch and almond flour is a fun extra, like the bobble on a hat. Sure, it’s nice to have a bobble, but the hat will keep you plenty warm without it. Some tips on buying grass-fed butter. A list of a few butchers in Australia. Where to buy almond flour in Australia (there’s another list here with a few different stores if you didn’t find anything on the first one). You can also make almond flour by grinding almonds in a food processor. If you really do want the nut flours and alternative gluten-free foods, finding them can be a little trickier, but many people have good luck at health-food stores or online. Meat is so important for Paleo nutrition that it’s worth discussing in a little bit more detail, especially because you can’t always trust packages to tell the truth. You’ve probably seen guides for US readers struggling to find truly grass-fed meat in stores: here’s the Australian version. from Australia). Australia has a lot of available grazing land that isn’t good for farming, and fortunately escaped the ridiculous corn subsidies that the US has to deal with, so there just wasn’t the economic pressure for factory farms. 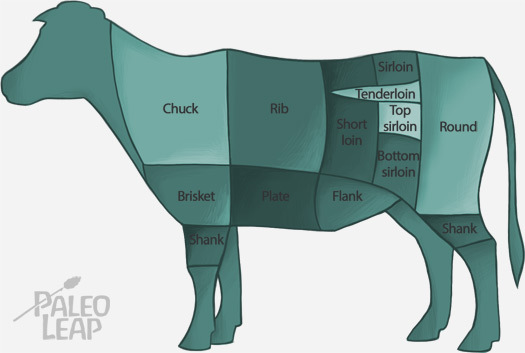 Grass-fed beef in Australia and New Zealand. You might have to go looking if you want beef that was grass-fed from start to finish, but it’s still not difficult to find. The same goes for lamb; Australian lamb is typically grass-fed and quite easy to find. Another great choice for meat in Australia is game meat. Kangaroo is one of the most common options: it’s available almost anywhere, and it’s very high in conjugated linoleic acid (a kind of fat with serious weight-loss benefits). You can find it at any supermarket. Emu is another game meat that’s commonly available, and you’ll probably be able to find more, depending on where you live. Here’s a guide to Australian poultry labels (scroll down to the chart and ignore the vegetarian stuff): “Certified organic” is the best. For getting wild-caught, sustainable fish, you could look at this sustainable seafood guide from the Australian Marine Conservation Society. Australian Paleo dieters might be in the minority, but you’re definitely not the only one! Here are some Australia (and New Zealand)-based bloggers. For recipes written for US audiences, here’s a converter from Imperial to Metric measurements. “Zucchini” in US English = courgette. “Eggplant” in US English = aubergine. And just in case you were wondering, Vegemite is not Paleo: it’s not gluten-free because some of the ingredients are sourced from barley. 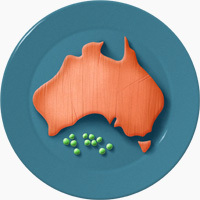 99% of the time, eating Paleo in Australia is just like eating Paleo anywhere else. You don’t need a lot of really fancy US-only ingredients to cook good food; focus on the basic meat, fat, and vegetables. From that perspective, it might actually be even easier to get good meat in Australia, since factory farming isn’t as entrenched: even if you’re stuck with the cheapest of the cheap meat, it’s likely better than the cheapest of the cheap in the US! It might be a little annoying to be swamped with winter recipes right now in the middle of your summer, but why not try something cooked on the grill and save the warming roasts and hearty soups until you really want them?